Root Canal treatment is a common prescription for abscessed teeth and is often a better alternative to extraction. The benefit is to prevent further tooth loss and shifting. Abscessed teeth have infected tissue (pulp) in the centre. This causes pain and/or swelling. During Root Canal treatment, the tooth is opened and infected tissue removed. The space is then filled and the opening sealed. A crown may be placed to protect the tooth. 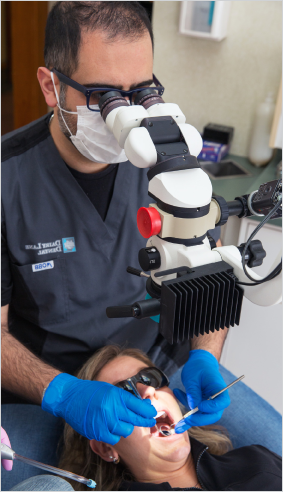 Our professional team uses state of the art technology by means of microscope assisted root canal treatment. It is one of the most revolutionary developments in the field of endodontics . This makes it possible to identify and treat even minute structures and problem areas. A tooth that has had a Root Canal treatment can last a lifetime!